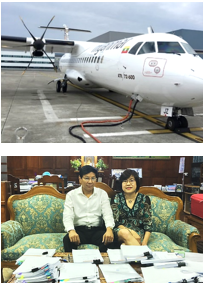 Myanmar’s National Flag Carrier, Myanmar National Airlines (MNA), celebrated New Year’s Eve with the delivery of their second ATR 72-600 acquired from AVIONS DE TRANSPORT REGIONAL (“ATR”). MSN 1309 was the 88th aircraft manufactured by ATR for the year 2015 and the last aircraft delivered for 2015. JTJB had the privilege of acting for MNA in the review and negotiation of documents as well as the final delivery of MSN 1309. This is the second ATR 72-600 which the firm has assisted MNA to accept delivery. JTJB has subsequently been appointed to assist in the delivery of the third ATR, scheduled to take place end April 2016. The project was led by Florence Goh, JTJB Partner and Head of Corporate Department. JTJB is proud to be appointed as the legal counsel of the MNA, to provide support for the growth and expansion of its business in the highly competitive aviation industry in Myanmar. JTJB’s Corporate & Corporate Secretarial Practice Group provides a full range of corporate legal and advisory services. For more information on our corporate services, please contact Ms. Florence Goh at florencegoh@jtjb.com. JTJB Senior Partner, Mr. Danny Chua, held a Joint Seminar with Managing Director of Liberian Corporate Registry, Ms. Hilary Spilkin on 18th February 2016, Thursday. Danny spoke on the topic “The Griffon: The Ghost of Blankenstein – Payment of Deposit under a MOA”. The topic considers the recent case of The Griffon  1 All ER (Comm) 593, in which the English Court of Appeal departed from the previously held view that a seller is only entitled to claim compensation for its losses where a buyer fails to pay the deposit under a memorandum of agreement for the sale of a vessel. Danny examined the practical issues in respect of the seller’s right to claim for the deposit under the MOA, even where no loss has been suffered. As Managing Director of the Liberian Corporate Registry, Hilary oversees the development and administration of the non-resident domestic business registry, while also being responsible for reviewing and recommending changes and providing policy determinations on the Liberian Associations Law and other legal provisions affecting Liberia’s non-resident domestic business entities. Hilary spoke on “An Open Registry Vessel Registration Roundtable” and gave an overview on the Liberian Registry, registrations / mortgage procedures and an introduction to the corporate registry. For more information on the seminar topics, please feel free to contact Mr. Danny Chua at dannychua@jtjb.com and Ms. Hilary Spilkin at hspilkin@liscr.com. JTJB is pleased to announce that the firm has been ranked in the Chambers Asia Pacific 2016 Guide in the Shipping Category. JTJB Senior Partner, Mr. Danny Chua, has been named a Notable Practitioner under the category. JTJB Senior Partner, Dato’ Jude P Benny has been selected by peers for inclusion in the Eighth Edition of Best Lawyers in Singapore in the fields of Maritime Law. This is the seventh consecutive year since the Best Lawyers’ second edition (released for 2009) that Dato Benny has been recognized in Best Lawyers under Maritime Law. Best Lawyers® is the oldest and most respected peer-review publication in the legal profession. For more than three decades, Best Lawyers lists have earned the respect of the profession, the media, and the public, as the most reliable, unbiased source of legal referrals. JTJB is pleased to announce that Senior Associate Walter Ferix was promoted to Partner as of 1st January 2016. Walter is an experienced civil and commercial disputes lawyer. He has handled a wide variety of cases including contractual claims, professional negligence, criminal matters and high value matrimonial matters.